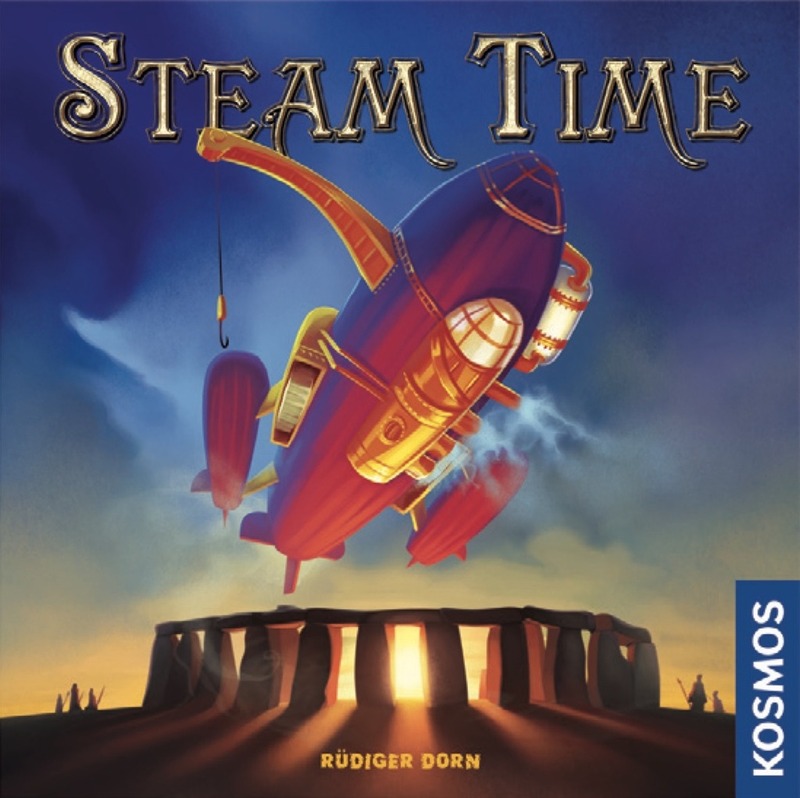 In a bit of a departure from the usual mainstream German family game, the new KOSMOS release, Steam Time, has players acting as captains of steam power airships that flit from age to age to different historic monuments in a quest to recover unusual crystals which have supernatural properties. Each player is given his own airship, conveniently located on that player’s personal board. There is a track to manage the amount of steam your air ship has to use. There are also 6 different rooms, each one using a different colored crystal to do cool stuff. Players are given 3 wooden airship tokens that they will use in the game. There is a very complicated sort of L-shaped board in the center of the table. 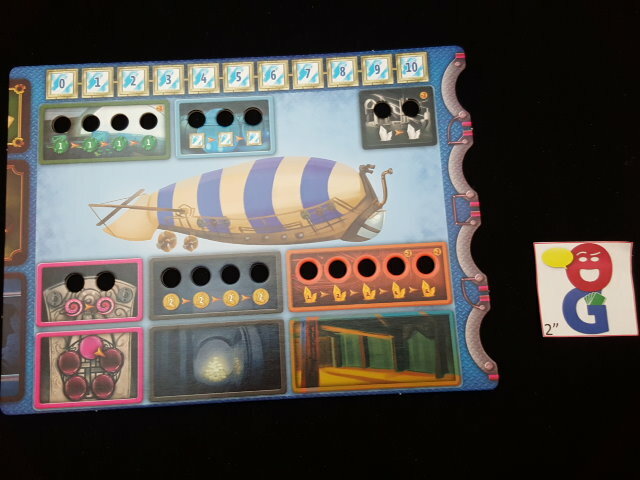 The left-side is dominated by the Esteem track (not to be confused with the Steam track on your airship board) – these are the Victory points in this game. There are lots of little boxes clustered at the top to store clear TIME crystals, the encounters deck, the missions deck, the expeditions deck, the effort deck, etc. The rest of the playing space is generated by laying out monument boards – each of these depicts a famed historical monument, and each offers action spaces in five of six possible slots. These monuments are seeded with crystals on the appropriate spots on crystal cards. Mission cards (if available) are placed to the right and expedition cards are placed to the left. Finally, if there is an upgrade action slot, an upgrade token is placed on that area. The game is played over 5 rounds, each with three phases: Income, Action, Supply. In the Income phase – players receive rewards for previously played upgrades. In the first round, nothing happens in this phase because no one has had a chance to buy any upgrades yet! This might allow you to get more gold from the supply, gain Esteem points, pick up crystals from the supply or the board. 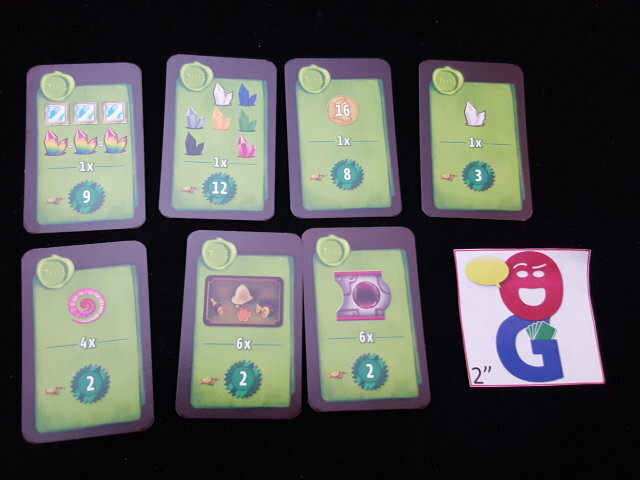 1 – Mission – choose a mission card and place it next to your board; these cards will raise your esteem if you have the correct resources or components at the end of the game. Further, for each green crystal you have on your bridge, you gain Esteem. 2- Encounter – draw 2 or 3 encounters and choose one to perform. There are always 2 parts. Blue sections are done by only the active player. Purple parts can be performed by everyone at the table. If you have blue crystals on your ship, you get bonus steam power. 3 – Crystal Deposit – Buy crystals for 2 gold each. If you have black crystals, you get clear TIME crystals from the board. These clear TIME crystals can be placed anywhere – though they always have to be placed as the rightmost crystal in any line. 4 – Upgrade – these allow you to improve your ship. You will find letters printed on the upgrade piece that tell you how many crystals you need to spend, the effort card decodes the letters to tell you which colors of crystals you need to spend. If you do not have the right color crystals, you can spend one steam to change the color of a crystal to any other color. As a bonus, you get to rotate your marker on your time portal forward for each pink crystal you have – each time that you make a complete circuit of your time portal, you get an immediate extra action. 5 – Gold – Take X gold from the supply. As a bonus, gain 2 extra gold for each gray crystal on your board. 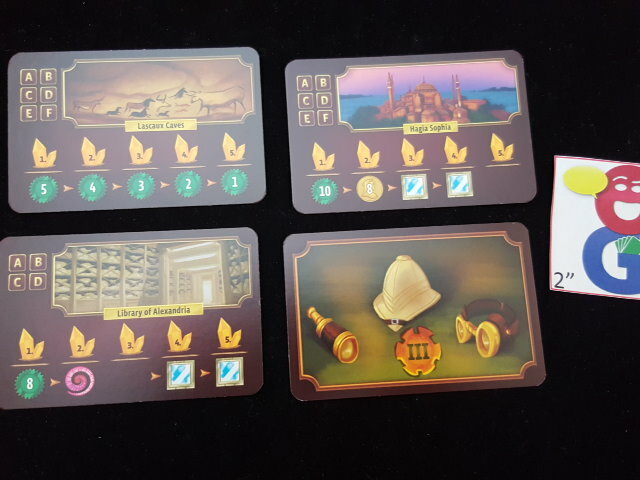 6 – Expedition – Pay the expedition cost (again using letters to tell you how many and the esteem card to tell you which colors) and take the expedition card in that row. There is a chart showing you what rewards you get for having 1 to 5 orange crystals on your board. For this action, there is no bonus, you simply get progressively larger payouts for the expedition for having more orange crystals. It is important to note that you must always be traveling forward in time. Thus, each time that you place one of your airships, you must place it on a monument board closer to the top of the stack than any of your previously placed airships. OK, so those are the action choices. But, remember, you could also choose to be the starting player. Well, if you are the first player to go in a round, you cannot choose the start player token – every other player gets at least one chance to take it away from the current first player… Whoever takes the first player token can either: A) convert 1 steam into 1 esteem (may do 10x) OR B) convert 1 steam into 1 clear TIME crystal. You do not use one of your three ships when you take the start player token; however, you do not lose the ability of your ship, you simply will be the last player to take a ship action in this round as there will eventually come a time when you are the only player with a ship left. In the Supply Phase, the board is reset for the next round. The top-most monument board is placed at the bottom and everything is shifted up to fit back in the board. All crystals left on the board are placed back in the bag, and all cards (expedition, missions, upgrades, effort) are discarded. The game ends at the end of five rounds. 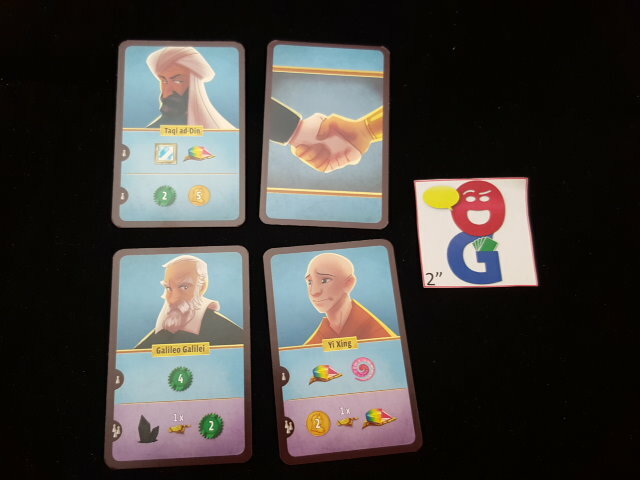 Players gain Esteem points through the course of play, and at the end of the game, all players evaluate their Mission cards to see if they meet the requirements on that card; note that some of the Mission cards can be completed multiple times. Move your score marker ahead for each Mission that you have completed. The player with the most Esteem points wins the game. If there is a tie, the player with the most crystals on his board wins. When I heard that Kosmos was going to do a new Dorn game, I was fairly certain that the game would be a balancing act between the more complex mechanics associated with most Dorn games (Snapshot being the exclusion) with the simpler, more mainstream focus of most Kosmos games. The question for me was – which of these two opposing forces would win out? Steam Time ends up being a nice melding of those two qualities – a more-complex-than-average game that is still accessible to gamers of all abilities. The setup takes a bit of time, but the rules give you an easy-to-follow 21-step roadmap that takes up two of the early pages in the rulebook. 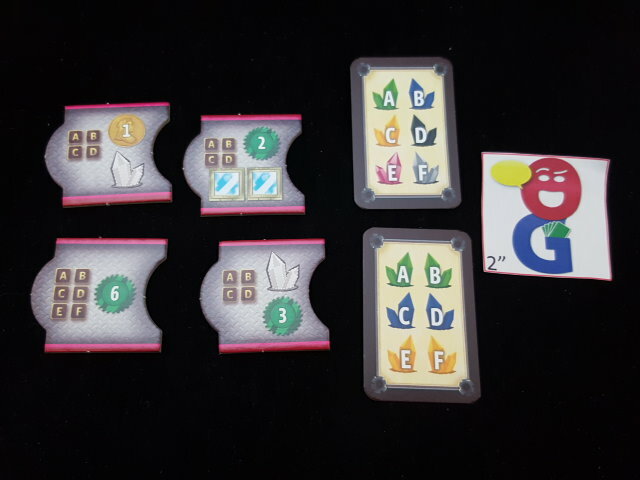 The rules themselves are fairly easy to follow, though I’d recommend that you make a second pass through when done reading them in order to read all of the placement rules which are split up into different accent boxes on different pages in the rulebook. Once you get the game setup, the gameplay itself is straightforward – at least as far as understanding what the possible action choices are. There are only 6 different types of actions, and none of them are overly complicated. Where the hard part comes in is trying to figure out in which order to do those actions, and how to ensure that you get the actions that you want. Given this competition, there is a good advantage to going earlier in the round, and I like the mechanism of having to choose the first player tile in order to go first in the next round. 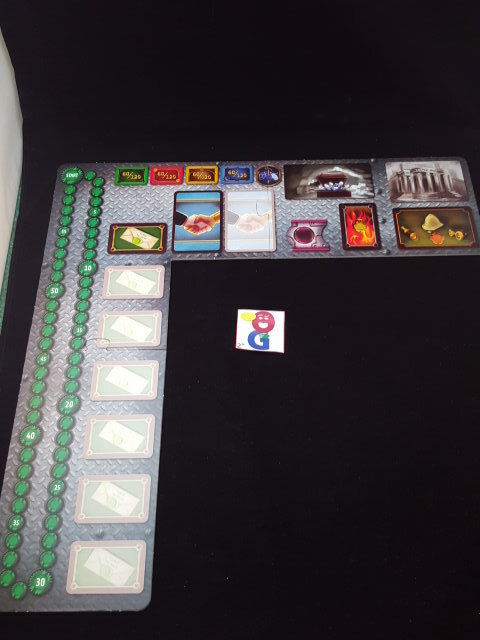 There is a somewhat useful action associated with the tile, and unlike most other worker placement games, I really like the fact that you do not have to spend one of your precious limited actions simply to take the first player token. The end of each round becomes a tense game of chicken as players try to determine whether they can forego their current action and essentially move to the end of the line for the current round in order to take the first player token for advantage in the next round. Though I would not call it a “game mechanism” – I have always liked games with a very small and finite number of actions. In Steam Time, you only get 15 personal actions (though it is possible to get a few bonus actions from your time portal bonuses), so you really want to do something positive with each play. Thus, you must choose actions that help your overall strategy – though sometimes getting a good bonus reward from an action can more than make up for a suboptimal action. There is a bit of luck/variance in the effort cards that come up each round. The cost of upgrade tiles and expedition cards is completely dependent on the random Effort card that comes up, and if you have been collecting gem colors not shown on the Effort card, you’re either not going to be able to buy cards/upgrades OR you’re going to have to spend a LOT of steam in order to get the right color combinations to do anything. And while I’m talking about Steam, I’d like to voice my displeasure with the cute play-on-words used in game terminology with Steam and Esteem. Yes, I think it’s clever to use words that sound so similar to describe two different tracks in the game, but in practice, it leads to a lot of confusion. After the first round of the first game, my group pretty much put an embargo on the word “esteem” and replaced it with the simpler term of “victory points”. While I’m all for a good play on words, I don’t like it when it compromises clarity of game play. Our games have clocked in closer to the two-hour range thus far, but I can certainly see 90 minutes for gamers who have experience with the game. There is a little bit of downtime between your actions – as only the card action has some possible interaction with other players – but each individual action doesn’t take too long, so your turn comes up fairly quickly, even if you aren’t doing much between each of your decisions. Steam Time is one of my favorite games to come out from this year’s Essen, and though I’ve only played it twice, it looks to be earning a spot in the permanent game collection. 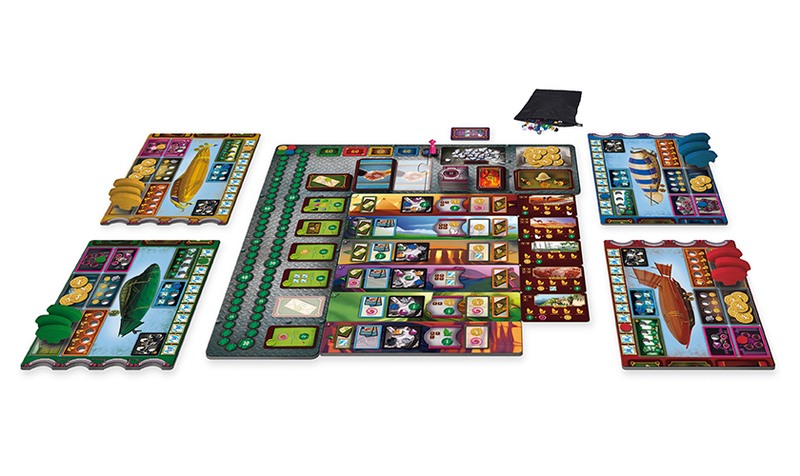 In combination with Tumult Royale, it’s a pretty good selection of games for Thames and Kosmos to choose for their Essen debut, and I hope that this set of games gains them a nice foothold in the domestic market here in the US. Jonathan F.: I’ve only played it once, and quite liked it. I look forward to finding out if specialization is generally the path to victory, or whether way to blend multiple paths and score as well. If everyone is jostling for gems, does that make another path more viable? If you go gems and everyone else does too, can you shift your strategy midstream and come out ahead? Only time will tell. Nathan Beeler: I also have only played once, but it was easily my favorite eurogame from this year’s crop. There was room to make plays within the decision space, but it wasn’t so open as to cripple everyone with AP. Looking forward to more plays.